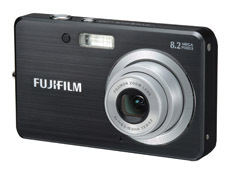 The Fujifilm FinePix J10 (announced 24 January 2008) is an 8 megapixel digital camera wth a 3x optical zoom lens (37mm-185mm equivalent) and a 2.5 inch 230K pixel LCD. The Finepix J10 available in black and silver is only 23 mm thick and will have a retail price of $149.99 when it reaches stores in March. FUJIFILM U.S.A., Inc. today announced the debut of a brand new J-Series of digital cameras with the FinePix J10 and J50. Designed for consumers seeking an affordable digital camera that doesn’t compromise on features, the FinePix J10 and J50 provide powerful, easy to use models that fit into a pocket or handbag for instant accessibility. Housed in a compact chassis just 19mm thick, the FinePix J10 incorporates an 8.2-MegaPixel CCD sensor, a 2.5" LCD and a 3x Fujinon optical zoom lens that captures large groups or distant subjects with ease thanks to a 38mm-113mm equivalent. The FinePix J50 takes things one step further with an 8.2-MegaPixel CCD sensor, a high resolution 2.7", 230K pixel LCD and a Fujinon 5x optical zoom that provides a 37mm-185mm equivalent – this time housed in a chassis only 23mm thick. The FinePix J10 is available in Matte Black and Brushed Silver; the FinePix J50 is available in Brushed Silver. Both models use Fujifilm’s Picture Stabilization Technology to reduce blurry images that can be caused by camera shake or subject movement especially in low light settings. Automatically choosing the correct light sensitivity and best-matching shutter speed, the FinePix J10 and J50 help to freeze the action and produce the highest-quality digital pictures without the blur and noise often associated with low-light photographs. "We wanted to provide consumers with an affordable, easy to use digital camera that still offered a competitive feature set," said David Troy, senior product manager, Consumer Digital Cameras, Electronic Imaging Division, FUJIFILM U.S.A., Inc. "The new J-Series combines these advantages in a highly portable form factor making it easier than ever to ensure that you never miss a shot." Scene modes: Pre-programmed scene modes provide top-quality photos in a wide-range of shooting conditions. Both models have 15 scene modes. Movie Mode: J10 captures VGA and QVGA quality movie clips and J50 captures QVGA quality, both at 30 frames per second with sound. Great for when you don’t have your video camera on hand. xD / SD / SD-HC Compatible slot: The FinePix J10 and J50feature an "xD/SD Compatible slot" which accepts not only Fujifilm’s traditional xD-Picture Cards but also Secure Digital (SD) and SD-High Capacity/SD-HC cards too. The FinePix J10 and FinePix J50 will debut in March 2008 with retail prices of $149.95 and $179.95, respectively. This entry was posted in Fujifilm and tagged Fujifilm, Fujifilm Finepix, Fujifilm Finepix J Series on March 11, 2008 by jonathanb.